If you're looking to roll in more productivity, roll up to the jobsite in a new set of wheels. 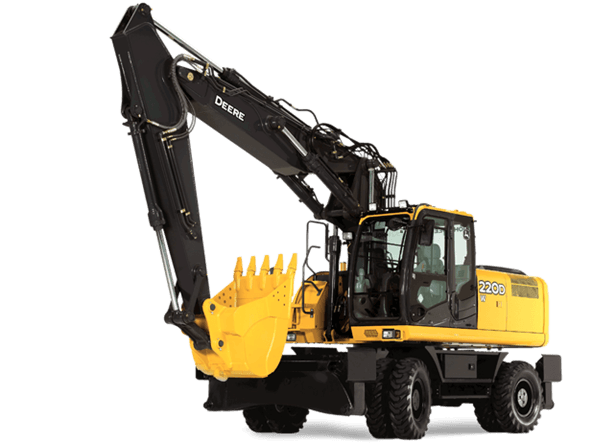 The bigger, stronger 220D W Wheeled Excavator travels on tires, so it's more mobile and maneuverable than truck-mounted and tracked excavators. This model features a heavy-duty fuel-efficient engine, along with a host of other productivity and uptime-boosting enhancements. Like a highly efficient cooling system. And a best-in-class cab with more legroom, noticeably lower noise levels, and an easy-to-use multifunction monitor. Delivering the power, smoothness, ease of operation, and comfort you'd expect from Deere, this excavator has everything you need to get more done for less.